Find out more about Gearset and some of our customers, or download one of our whitepapers on DevOps best practice. Gearset's browser-based UI lets you pick the exact components you want to deploy and builds your package file with a click. Directly connect your orgs to git with full native support for leading version control providers. Successfully deploy tricky metadata types with Gearset's problem analysis, which fixes problems that ordinarily cause Ant to fail. Easy comparisons between orgs with a line-by-line diff view that lets you quickly see the configuration differences between them. Easy deployment of profiles and permissions, with granular control over what you deploy. Org change monitoring and snapshots mean you can say goodbye to spreadsheets and accidental overwrites. Finding the right release management solution will speed up project delivery, boost team productivity and deliver a clear ROI. So how do you make such an important decision? Be wary of competitor comparison documents - they’re often highly selective in the features they showcase and can be misleading. Prioritise solving the key challenges in your release management over ‘nice-to-have’ features. Test each tool against your requirements to confirm they meet your needs before making a final decision. Salesforce DX is the future of building on the Salesforce platform. But how and when should teams adopt DX? 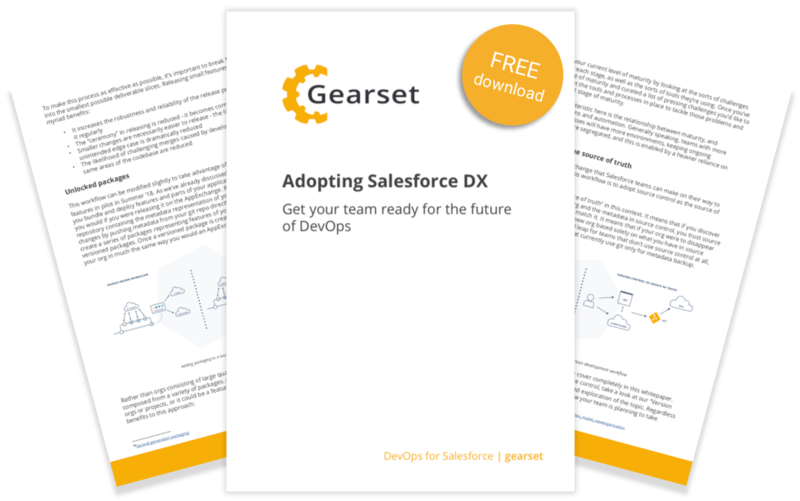 In this whitepaper, we look at the motivation behind DX, the ways it's revolutionizing DevOps for Salesforce, and how teams of all shapes and sizes can benefit from its adoption. Static code analysis helps you craft better software on Salesforce. 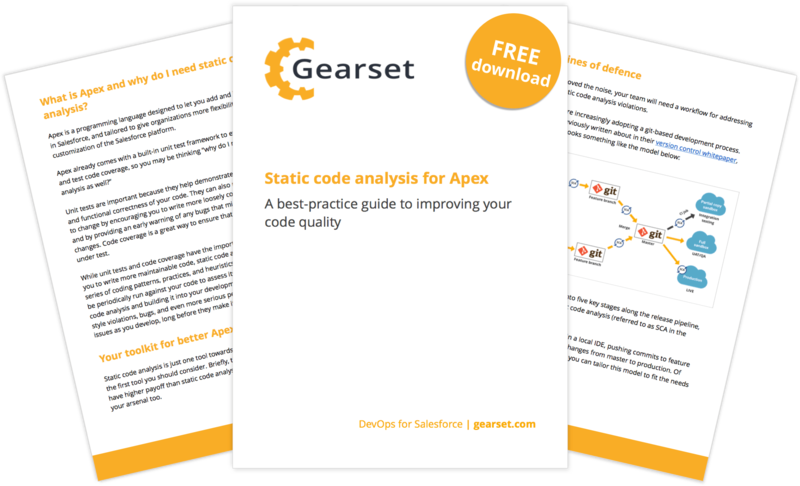 Written with Salesforce Architect and community member Eric Kintzer, this best-practice guide explores what static code analysis is, how it helps you write better code, and how you can integrate it into your development lifecycle using a DevOps tool like Gearset. 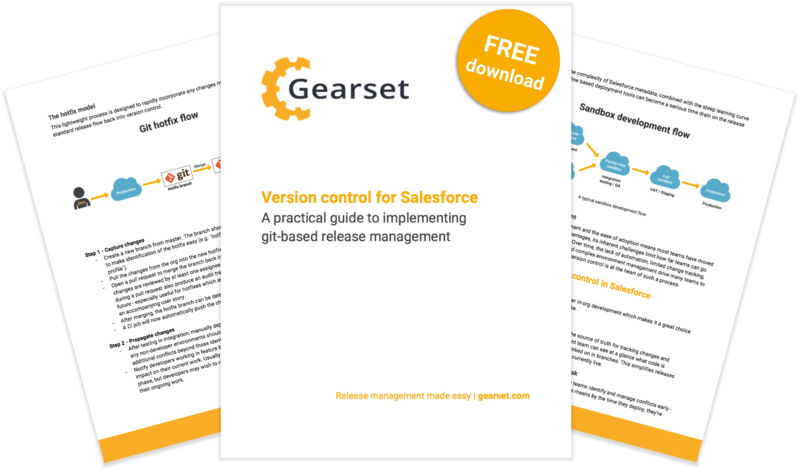 Version control is a powerful tool for ensuring effective release management, yet its adoption in the Salesforce ecosystem is surprisingly low. This whitepaper examines how version control works, the benefits of version control over in-org development, and introduces a best-practice guide for implementing version control in your business. 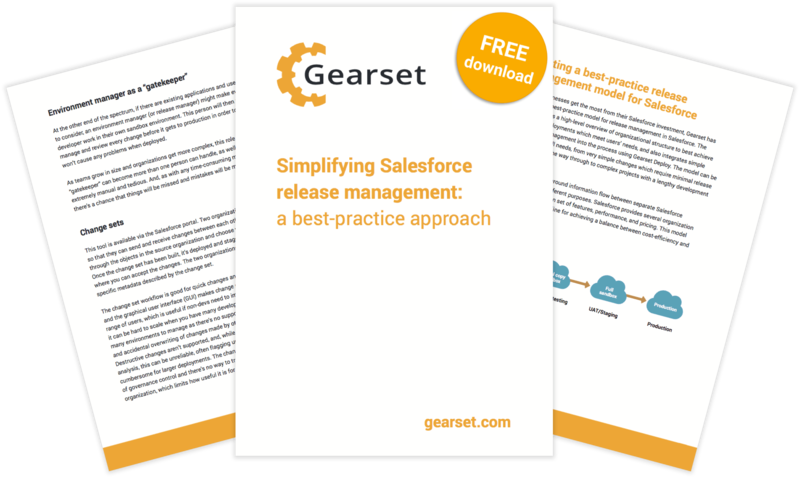 Gearset has developed a best-practice release management framework to help businesses gain the most from their Salesforce investment. From individual developers to complex, multi-team projects, this framework provides insight into managing risk, maximising cost efficiency and improving deployment success rates.